If your dog is lost, the time for action is now. Waiting even a few hours means losing valuable time to search. Anyone can lose a pet, even in spite of the best preventive measures. Don't beat yourself up about it. Now is not the time to lay blame on yourself or others. As soon as you realize your dog is missing, your search must begin. Here's how to search for a lost dog. Why Is Your Dog Lost? Determining the reason your pet disappeared may help with your search. Dogs that have run away due to ​fear or phobia are likely to be hiding at first. Dogs that disappeared after chasing something (like a cat or rabbit) may have lost their way and traveled quite a distance. Some dogs take off when an opportunity presents itself (like an open gate) while others will do whatever it takes to escape (like digging under a fence). Curiosity takes over, and they might end up wandering far away. A lost dog can travel several miles in a day, so be prepared to search a five-mile radius in the first few days. Over a period of weeks, a dog may travel as much as 100 miles or more. Think about places that might attract your dog, like nearby friends' homes, parks, homes with other pets, buildings with dumpsters, food establishments, etc. Ask neighbors, family, and friends to help search on foot and in the car. Everyone should have a collar, leash, and treats. If your dog likes squeaky toys and other dogs these can be helpful. Use flashlights to check under buildings, vehicles and other dark spots. Searchers should call your dog's name in an upbeat manner, squeak toys, and maybe try a loud whistle to get your dog's attention. Visit LostDogSearch.com for more search tips. Cover a five-mile radius around where your pet was last seen. Post signs at major intersections in the area and make sure they are secured to poles with heavy duty tape. Hand out flyers to neighbors and other people in your area, including mail carriers and delivery persons. Ask as many local businesses as possible to post your fliers in visible locations. Visit local dog parks, handing out your flyers and posting one or two on the premises. Talk to anyone you encounter about your dog and hand out flyers. You never know who might have spotted the dog. Go in-person to the local animal control and as many pet rescue groups and animal shelters as possible. Bring along your fliers and take some time to look through the facility for your dog. Making phone calls is not ideal because the people answering the phones might not have up-to-date information. Visit AnimalShelter.org for listings in your area. For starters, go to your vet's office and let them know what is going on. This will allow them to make a note in your dog's chart and can prepare them if your pet is found injured and needs to be seen quickly. Bring flyers for them to hang in the lobby and the staff areas. Next, contact other vet offices, pet groomers, and pet supply stores in the area and ask them to hang flyers. Animal professionals tend to find a lot of lost pets, whether it is in the workplace or on their own. It may also be helpful to find local lost pet websites. Search by state, county or city. The use of social media has helped recover many lost pets. It's just as important to post listings online as it is to put up signs in the neighborhood (maybe even more important). Reach out to your contacts via Facebook and Twitter to put everyone on the lookout. Contact local community sites like Nextdoor to see if an entry about your lost pet can be posted. Your online contacts can easily re-post your story to their online contacts, creating a huge amount of exposure. Also, people can easily post updates if, for instance, they spot your dog in a specific area. Sadly, there are criminals who see your misfortune as an opportunity to gain money. Avoid posting the reward amount on signs and flyers, and do not give out your full name or address. 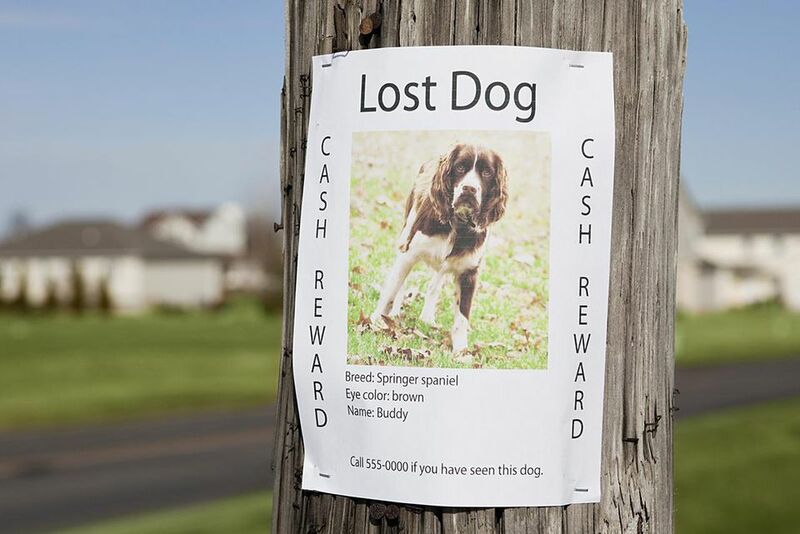 If you receive a tip about your lost dog, do not send money until you have your dog back in your arms. Never go alone to pick up your dog from a stranger. Bring along one or more friends, and tell others where you are going. Dogs are survivors. There is a good chance your lost dog is out there somewhere. Your pet might be hiding or simply wandering. The dog could have been taken in by an individual or a rescue organization. Keep getting the word out, and you will increase the odds of finding your lost companion. There are plenty of stories about lost pets being found several months or even years after they went missing. Do not chase your dog if he is spotted; this may cause it to run away. Make sure everyone knows how to approach a shy or fearful dog. Leave fresh food and water outside your home along with a dog bed and shelter if possible. Periodically visit the locations of signs and flyers to see if they need to be replaced. Post a large sign on the back of your car. Ask if friends and family members to do this as well. When your dog is found, remove posted signs and add a happy update to online listings.